"The era between the end of the American Civil War and the outbreak of World War 1 saw only a few fleet actions between naval powers, though three of these – the Battles of Manila Bay, Santiago and Tsu-Shima – were to have major consequences for the history of the 2oth Century and beyond. At a smaller scale however two engagements between the fleets of Greece and Turkey were to have major local significance and it is with the first of these, the Battle of Elli in December 1912, with which this article is concerned. One notable aspect of the battle is that it mixed outdated relics of the ironclad age with ultra-modern vessels, some of which were to go on to play active roles in both World Wars…." Oh my goodness I've just this minute finished reading about this battle! Good timing. I've started ordering figures for the land war. So I'll need to find another source for the old iron clads then. Oh Elli is a favourite of mine. 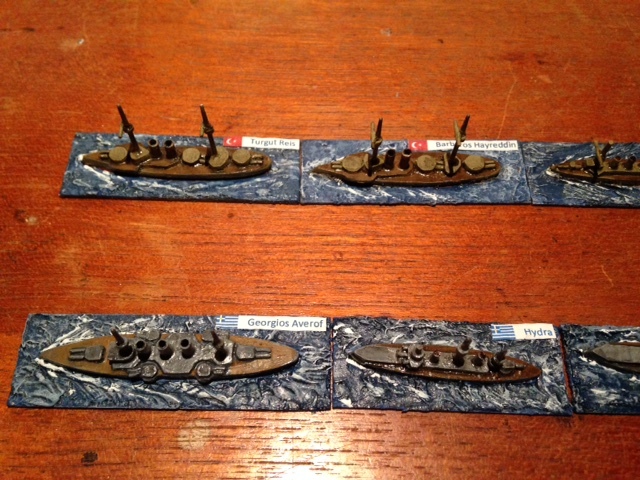 Even managed to passably scratch build the ships as well.